Bake or use pre-made sugar cookies – any recipe will do so use a favorite. They can be soft or crisp depending upon personal preference. Use icing and pipe (you can use a zip-lock baggie with corner cut off) a dollop right in the middle to attach your gum drop. Pipe around edge of gum drop and then around the edge of the cookie itself. Use candy sprinkles in multiple colors or candy sugar or one color. Sombreros are always individual so have fun and be creative and make each one different. 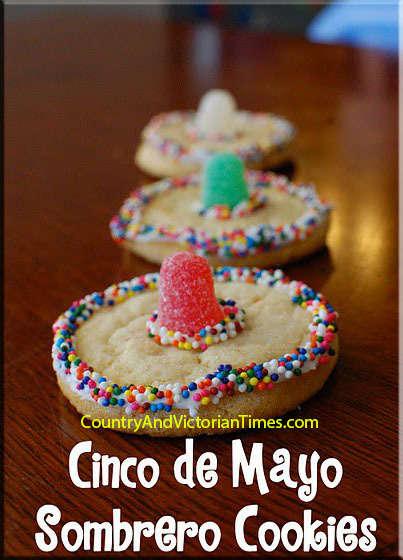 This entry was posted in Crafts ~ DIY ~ Projects, Recipes, ~Cinco De Mayo, ~Dessert, ~Edible, ~Holiday, ~Party, ~Snack and tagged bake, Baking and Confections, celebration, child, children, cinco, Cinco de Mayo, cookies, cooking, de, favor, festival, fun, help, Holiday Cookies, kid, kids, may, sombreros, Sugar cookie, ~Home, ~Party. Bookmark the permalink.